During our recent holiday around Spain we did not visit all the places that we had planned due to the poor weather on the north coast which is unusual for this time of year. 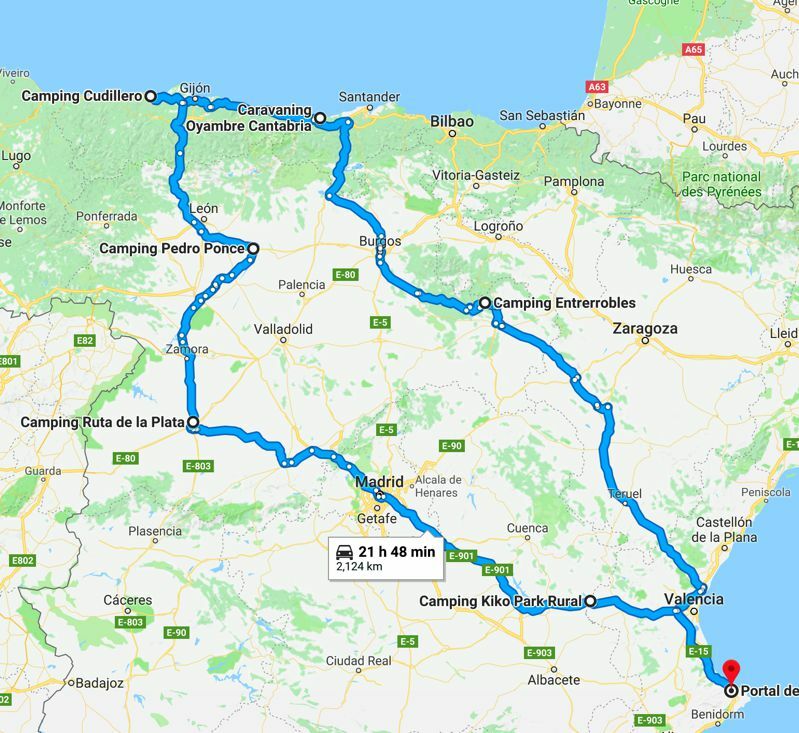 However, we had a great time away for an extended period in our Adria Sonic, we covered a total of 2163 kilometres and this consumed 255 litres of diesel which cost €308 and we stayed in 6 different campsites for a cost of €309. Camping Entrerobbles near Soria – this was our second visit to this site and nothing has changed in the 12 months since our last visit, there was still no wifi, the pool wasn’t yet open despite the 32 degree temperature. The mushroom meal in the campsite restaurant was very good like last time. The site is remote and transport is needed for a longer stay. Cost €23pn. Caravanning Oyambre near Comillas – again this was our second visit to this site and nothing had changed in the year since we had last stayed here. We stayed in the same area as last year. Unfortunately the weather was poor with rain, wind and grey skies every day. The campsite restaurant was as good as before and the staff as usual were very helpful. The taxi into Comillas for the Friday market was only €6 each way. ACSI site. Cost €19pn. Camping Cudillero near Cudillero – a nice grassy site with large pitches and excellent fast wifi. The campsite restaurant was just OK and nothing special. This was another site where transport was required to do any local exploring as it was some distance from town and a steep climb down to the beach down a twisty road. The weather here was terrible with torrential rain, hail storms and high winds. ACSI site. Cost €17pn. 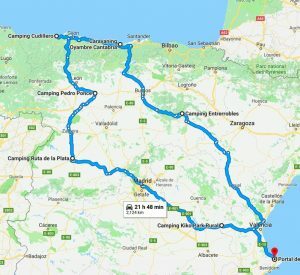 Camping Ruta de la Plata near Salamanca – this site was very disappointing given that it was an ACSI site, the wash blocks and in fact the entire site was old and tired and in need of some time and money spending on it. The earth pitches were over grown with weeds, the trees were in need of pruning as they scraped both the sides and the roof of the motorhome. There was only one fresh water tap for the whole site and manoeuvring into the grey waste disposal point was not easy. The campsite restaurant was only open for light breakfast and closed for the rest of the day. The only thing to recommend it was the bus stop right outside the door to Salamanca itself. Cost €19.20pn. Kiko Park Rural near Villargodo de Cabril – again this was our second visit to this site in 12 months and nothing had changed. Reasonably large fully serviced gravel pitches with little shade and can be quite windy at times. The onsite restaurant is good and the free wifi speed is OK for emails and browsing but little else. The wash room facilities are starting to look a bit tired with shower doors rotting at the bottom and toilet cisterns not attached to the wall. Our most expensive site and not really worth the money in comparison with other sites that we stayed at on this trip. Transport would be needed if staying for any period of time as it is in the middle of nowhere. ACSI site that cost €28pn.